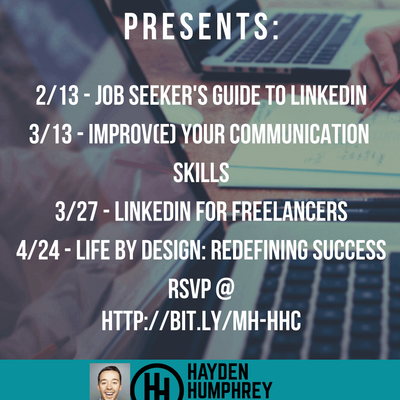 Hayden Humphrey Presents:2/13 - Job Seeker's Guide to LinkedInThis 90 minute workshop and discussion will be led by Hayden Humphrey, an ex-LinkedIn employee, and will focus on helping you fully utilize LinkedIn as a job-seeker. We will discuss how to create a killer profile to get found by recruiters, how to more effectively build a personal brand on the website, and how to bring it all together to advance your career.3/13 - Improv(e) Your Communication SkillsThis 90 minute workshop introduces participants to the wonderful world of improv as a means to improv communication skills, speaking presence, and overall self-expression. Participants are led through a number of improv games which are then debriefed afterwards for important lessons and takeaways. 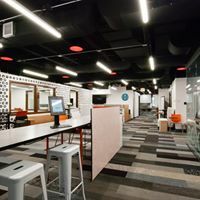 Participants are asked to come with a positive attitude and willingness to fully participate in group improv activities.3/27 - LinkedIn for FreelancersThis class focused on LinkedIn tips and strategies for Freelancer's and Entrepreneurs. 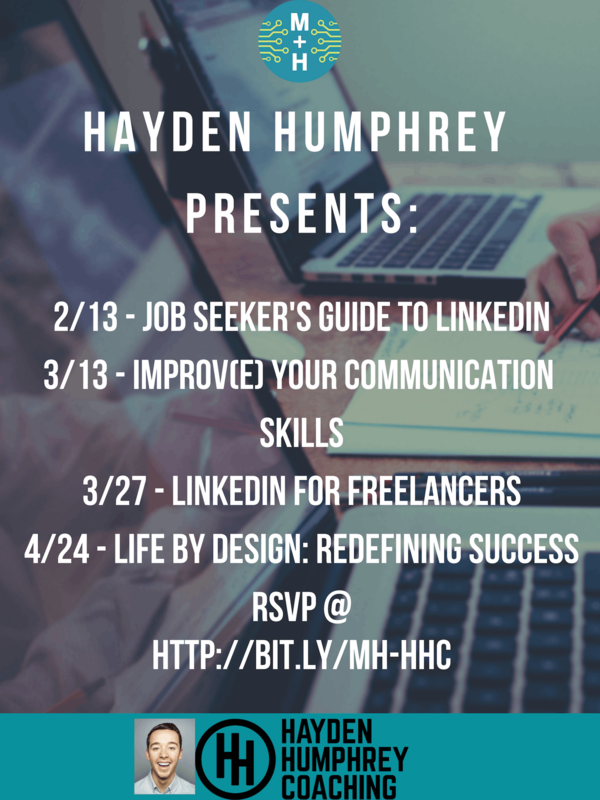 During this workshop, we will discuss personal and company branding, purposeful publishing, and how to find clients and sell yourself.4/24 - Hayden Humphrey is out to document and elevate the human experience through coaching, speaking, and facilitated learning experiences. Hayden firmly believes that the best life is one lived on your own terms, and as a Success Coach, Hayden works 1:1 with individuals who feel stuck or unfulfilled to help them create lives they can be excited about every single day.